On January 31st 2014’s Friday Activity Day we welcomed Maida Berenblatt, therapist, counselor, and professor. She set up an activity with the children along with a song, “Why do you love yourself?” She is an expert and author of several books on self esteem, personal growth, and wellness planning. Maida has appeared on several TV talk shows, including twice on the Oprah Winfrey Show. 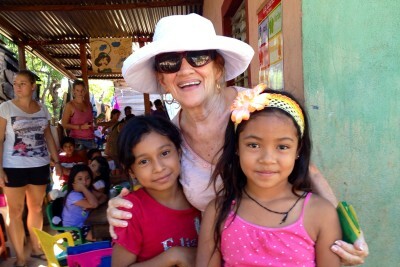 This is how Maida started off her visit with the kids in Pantanal, with the help of volunteer translator Laura Leibold. The visit continued like this, as she asked the students if they loved themselves, and why. The kids really took to Maida’s presentation, the watched, silently engaged, taking in all that she had to say. She called out individual students and asked them to list a few things that they loved about themselves. For most students, it took a few moments to find an answer; this isn’t a question that most of them are usually posed. While it took a bit of coaxing, the results were spectacular. Each child was given their own piece of paper where they wrote down a few things that they loved about themselves along with a picture. Their answers ranged from Jorge’s, “I love that I play soccer well” to Yuleydi’s, “I love my soul and form of being.” Watching seventy children try to express what they loved about themselves really brought the room alive. We will continue to implement Maida’s concepts, asking the students who show us completed work what they like about what they have done. 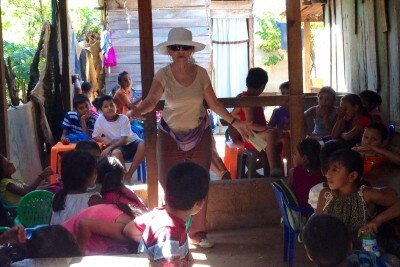 Thank you Maida for starting this important dialogue with the children of Pantanal!